One of these warriors is not like the other, as Master Sgt. Jacob Huckleby stands with Navy chief petty officers before a gathering of mostly Sailors and Marines to become a member of the Chief’s Mess, Sept. 14. In a ceremony familiar to Sailors, Marines and Coast Guardsmen but foreign to Soldiers and Airmen, Master Sgt. Jacob Huckleby, a senior Armor/Cavalry noncommissioned officer currently serving with U.S. Africa Command, became a member of the Chief’s Mess on pinning day,. And to make it more interesting, his sponsor wasn’t in the Navy–he is a senior chief petty officer of the Coast Guard. The chief selects and one Soldier arrive at the ceremony singing a Navy cadence. 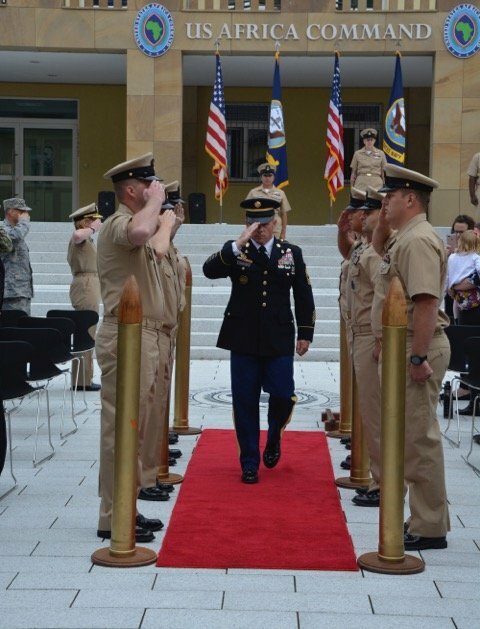 Huckleby’s blue Army Service Uniform stood out amidst the Navy Service Dress Khaki uniforms as he marched into the ceremony, singing cadence called by the Sailor leading the 11 inductees onto the square in front of the AFRICOM headquarters building. Pinning day was Navy-wide, as 4,704 active, 448 selected reserve and 262 full-time support first class petty officers were admitted to the chief’s mess, according to The Navy Times. 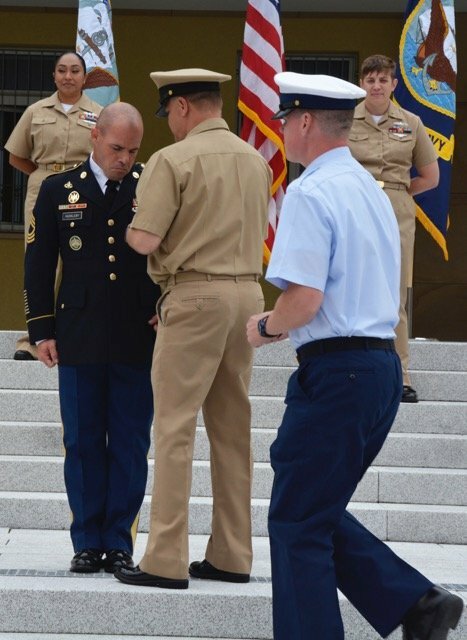 Navy Master Chief Joel Steinbach is joined by Senior Chief Petty Officer Richard Whitney to be ceremoniously pinned with the Chief’s Anchors on Army Master Sgt. Jacob Huckleby while Chief Jay Vazquez (off camera) approaches to put on Huckleby’s cover. An interesting part of the program was the chief selects singing the songs of the five services. When the call of “To the Army” was heard, a small scattering of Soldiers in the audience, surrounded by Navy and Marine duty uniforms, stood and robustly joined in singing the Army song. The Marines stood and sang their service song as well. Whitney and Huckleby became friends in July after marching together during the annual Nijmegen commemoration for the biggest airborne drop of World War II. During that time, the Coastie got to know the Soldier. “We marched 100 miles in four days with over 5,000 military personnel from 39 countries, and I witnessed his dedication in taking care of his Soldiers, his sound judgement and as an ambassador of goodwill–the qualities of a great chief,” said Whitney. Returning a salute as he passes through a cordon of sideboys, Master Sgt. Jacob Huckleby is welcomed aboard with two rings of a ship’s bell. Huckleby was introduced to the Navy’s CPO 365 program in 2014 and decided to pursue the opportunity to learn more about being life as an enlisted Sailor. The traditional Navy ceremony included the history of CPOs and a reading of the CPO’s charge, plus a dynamic, engaging story told by Rear Adm. Heidi Berg, J2, AFRICOM about her first chief and the impact he had on her career. After being pinned and having their cover ceremoniously placed on them by friends, mentors or family members, the 10 chief petty officers and lone master sergeant returned salutes to a party of sideboys as a ship’s bell welcomed them aboard the Chief’s Mess via a red carpet lined with ropes and cannon rounds. From left, Coast Guard Senior Chief Petty Officer Richard Whitney, Army Master Sgt. 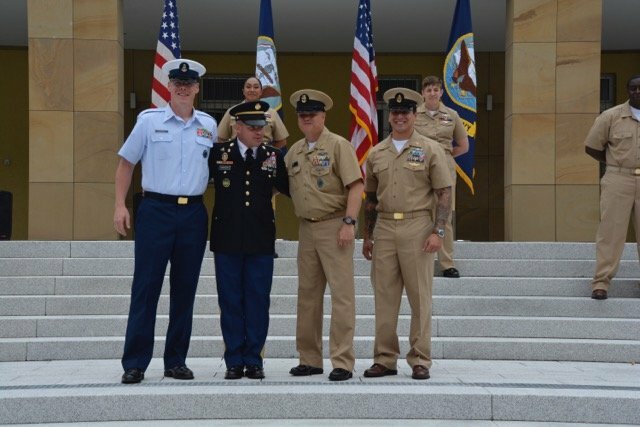 Jacob Huckleby, Navy Master Chief Joel Steinbach and Navy Chief Jay Vazquez pose together after Huckleby was pinned, Sept. 14.